This Irish bird feeder features a traditional welcome, the Gaelic word Fáilte. This Irish cottage bird feeder will look charming in your garden. 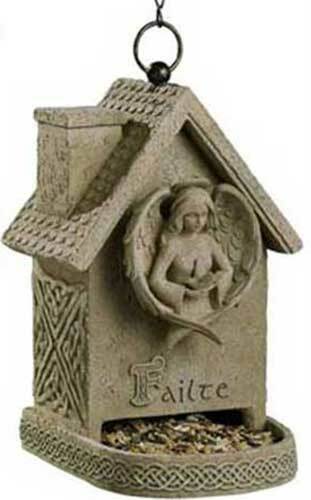 The Irish bird feeder features a sculpted angel along with Celtic knot-work on all sides and the word Fáilte. This weather resistant Irish garden decor is further enhanced with a removable plug above the chimney for easy filling along with a hook and chain for hanging and holes for drainage. The Celtic angel bird feeder is made of cement and resin and measures 6" wide x 10 1/2" tall x 6 1/2" deep.